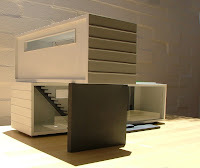 Wes Christensen has completed his first 1:12 modern dollhouse design. 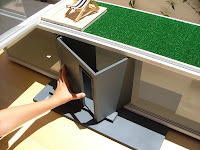 The Mini House 1 structure is made of MDF and gives the owner the ability to customize the interior and exterior paint. The two-level house features extensive glazing, a carport, removable bathroom insert, fireplace and a grassy rooftop deck. This is just one of several designs that Wes has planned. He welcomes any and all feedback about the design. They are ready for sale! And only $300 plus shipping. Want one of these beauties? You can contact Wes at wes@design-comm.net or via the My Modern Mini blog. Wow! Love the design of that house! My favourite is the roof garden! Swoon. This design came out wonderful! While this design is nice, I'm hoping for home2 to come out. 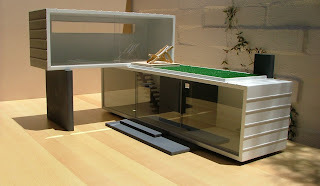 Have you seen his design plans (3-D renderings) on his flickr page? I know! It is awesome. It is reasonably priced too. 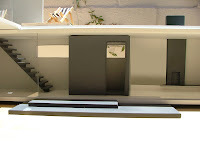 I am also anxious to see the second mini house in finished form. He's got mad skills.--ha ha! It's like a double Villa Sibi. An affordable, sleek, modern house? I think a flying pig just hit my window. So glad to see this! how beautiful! much quicker than my own project! i bet shipping to Australia will be pricey!! Ha ha! I just got Wes' message about the sale, etc. Too funny!